The most interesting thing about this list? It’s sorted by last name and starts with S! Further data mining also indicates that postdoc-ing is almost a prerequisite for faculty positions. Feel free to use the comments to add vignettes that I missed (any representatives of the first three-quarters of the alphabet?). A summer school in Algorithmic Game Theory will take place in Samos island (Greece) from 14 to 21 of July, 2012. The school is organized by Dimitris Fotakis, Paul Spirakis, and Alexis Kaporis and is sponsored by the University of the Aegean and Information, Communication & Systems Department, Greece. The school is open to under/postgraduate students and researchers in general at very low (early) accommodation costs. Roughgarden and Tardos revealed the power and depth of the “price of anarchy” concept as it applies to routing traffic in large-scale communications networks to optimize the performance of a congested network. Their paper “How Bad Is Selfish Routing?” revisits an old conundrum in transportation science known as “Braess’s paradox,” and provides remarkably complete results on the relationship between centralized optimization and selfish routing in network traffic. Nisan and Ronen coined the term “algorithmic mechanism design” in their paper of the same title, presenting a whole new range of applications of the theory of mechanism design within computer science. Combining ideas from economics and game theory with concepts and techniques from computer science, they enriched both mechanism design and the theories of algorithms and complexity. As EC 2012 and AAMAS 2012 (co-located in Valencia, June 4-8) approach, so do the paper submission deadlines of SAGT 2012 (Barcelona, October 22-24; deadline May 25) and COMSOC 2012 (Krakow, September 11-13; deadline May 25) with WINE 2012 (Liverpool, December 9-12; deadline August 1) shortly afterwards. For the first time at EC, a third of the papers will be presented in plenary sessions, with the other two thirds in parallel sessions. (Thus, attendees will spend half their time in plenary sessions.) Quality was a necessary but not sufficient condition for getting a plenary slot; it was also necessary for reviewers to judge that a paper had broad appeal. Some of the technically strongest work appeals to smaller cross-sections of the community, and so appears in parallel sessions. On Wednesday, we’ll have an overlap day with AAMAS, with which we’re collocated. To make the most of the day, we’ll have many joint activities: two joint invited talks (Colin Camerer and Moshe Tennenholtz), common coffee breaks, and two shared poster sessions (featuring EC papers, AAMAS papers, and EC-relevant papers published in the broader community over the last year). Over the past years, Yahoo! Research has become a powerhouse of research in algorithmic economics (as well as other areas). Sadly, their major basic research push that started with Noble intentions to win the Nobel prize (presumably in economics) has been facing serious difficulties for a while. First there were rumors about cancelled job interviews, then Prabhakar Raghavan jumped ship, and by the beginning of April it was clear that a tsunami was sweeping through Yahoo! Research. 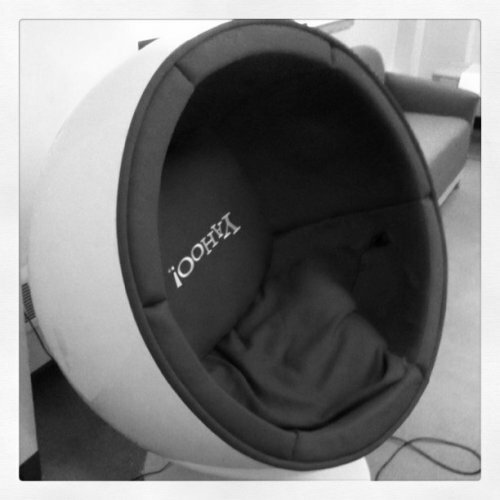 Personally I’ve had many great interactions with esteemed Yahoo colleagues, especially in the past year, and in fact I am the proud recipient of one of their space pod chairs! (Its delivery was an interesting experience, which started with a phone call from the delivery company about a mysterious 300 pound “machine”, and continued with the arrival of a huge, impregnable crate that resisted efforts to open it for two days.) So the Yahoo situation was on my mind. This week I was delighted to read the news that 15 of the Yahoo! NYC researchers have been assimilated into the benign MSR collective, and in fact will form the basis of the new MSR NYC lab. The first stories only mentioned by name three extremely prominent researchers: Dave Pennock, Duncan Watts, and John Langford. Today Dave disclosed a few more names: David Rothschild, Sharad Goel, Dan Goldstein, Jake Hofman, and Sid Suri. Wow, what a catch for Microsoft! Interestingly, much like the recently founded MSR Herzeliya lab (which is led by Moshe Tennenholtz), the MSR NYC lab will report to Jennifer Chayes at MSR NE, with Dave Pennock in a leadership role. I have it on good authority that, going forward, Yahoo labs may actually increase their investment in sponsored research, which I think makes sense. So the main uncertainty at this point seems to be the fate of the Santa Clara lab. At least two of the prominent SC-based members of the Microeconomics and Social Systems group, Mohammad Mahdian and Preston McAfee (the group’s leader) have recently become nooglers. In any case, it seems that the dust is settling, and overall the glass is half full: this mayhem has led to the creation of an exciting new lab and new opportunities for algorithmic economics. Dave, Duncan, Sid, et al. — congratulations and good luck! Networks have become pervasive in every aspect of our lives and have emerged as a crucial tool for understanding the world we live in. The World Wide Web, which links us to and enables information flows with the rest of the world, is the most visible example. Physical networks play a similarly vital role in wireless communication, data transmission, and energy production and distribution. Equally central are social and economic networks that shape opinions, information flows, and transactions. A fundamental understanding of network behavior, including the nature of interconnections, issues of stability, and decision making place operations research methodology at the core of this emerging research program. We invite high-quality submissions that advance the theory and application of operations research methods, including graph theory and optimization, economic analysis, game theory, and stochastic models, in the emerging field of network science. In addition to works contributing to the analysis of networks, we also encourage submissions using tools and concepts from network analysis in other application domains.